HubSpot's integration with Eventbrite allows you to collect new leads and track which contacts are registering for and attending the events you host. Use the search bar to search for the Eventbrite integration. Hover over the integration and click View integration. In the dialog box, click Connect to Eventbrite. On the next screen, enter your Eventbrite email address and click Get started. You'll be prompted to create an account or log into your existing account. Please note: only events created by the integration user (the user who logs in when connecting Eventbrite and HubSpot) will sync to HubSpot. The email address used to log in here must be the account administrator in the connected Eventbrite account. Click Allow to grant HubSpot access to your Eventbrite account. You'll be redirected to the Eventbrite settings screen, where you'll see your existing Eventbrite events. By default, sync will be disabled for your events. To enable syncing for an event, click to toggle the Sync switch on. A new contact properties group named Eventbrite will be automatically created, which will include two new properties: Last Registered Event Name and Last Registered Event Date. When a contact registers for a new event, these fields will be updated automatically. When someone registers for an event you've synced to HubSpot, you'll see an Eventbrite registration event on that contact's timeline. If the person registering for the event is not a contact, a new one will be automatically created for you. All standard Eventbrite registration properties (Cell Phone, Company, First Name, Last Name, Home Address, Job Title, and Website) will be included in the timeline event. Every time someone cancels their registration for your event, you'll see an Eventbrite cancellation/refund event on that contact's timeline. Every time someone attends an event for which they've registered, you'll see an Eventbrite attendance event on that contact's timeline (this requires that you check-in attending users via Eventbrite). Any new events you create in Eventbrite will sync automatically. You can disable this option by unchecking the Automatically sync new events box on the Eventbrite settings screen in HubSpot. You can also disable syncing for any event at any time by toggling the Sync switch off. Please note: the above segmentation options are not available in Marketing Hub Starter accounts. Once you've created your lists, you can use them to send one-off email blasts or as enrollment triggers in a workflow to send automated emails to your different segments to remind them of the event or follow up afterward. You can also use workflows to send follow-up emails after the event. 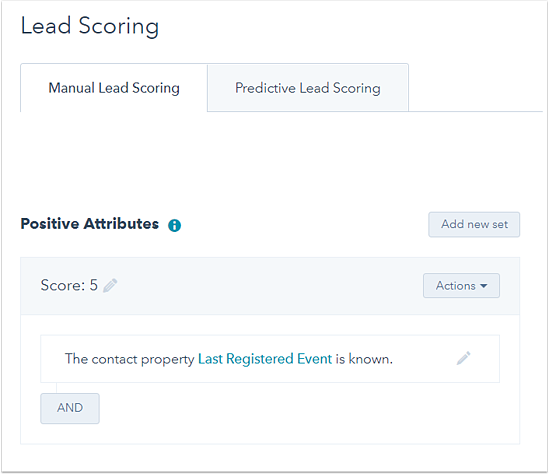 You can also set rules based on Eventbrite properties in manual lead scoring.